NuShield is great for anything that you would want to see clearly without having that horrible glare on the screen when you are out doors. It will feel like your outside. I would love this cause i do sometimes like going outside and getting on my ipad to look things up and of course their is that glare. With the Nushield I would be able to see much clearer. The photo on the left is outside without a nuShield and on the right is with the NuShield can you see the difference?? Enjoy your favorite electronic devices outdoors with NuShield DayVue adhesive screen protector. 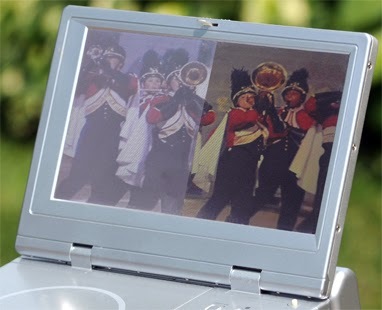 Now you can easily read the LCD displays on your PDA, laptop, iPod and thousands of other electronic devices indoors or outdoors in indirect daylight -- even when you're wearing sunglasses! With NuShield screen protection and glare protection, colors are so rich and sharp, you'll feel like you're indoors. NuShield protects you, too, with our 100% money-back guarantee. NuShield DayVue™ versus Bare Screen. On the left, in normal daylight, the unprotected screen is murky and hard to read. On the right, NuShield's DayVue™ eliminates harsh glare, reflections, and UV-B rays. These films work just like noise cancelling headphones, they cancel reflected light using optical interference. With our innovative antireflection screen protector, the difference is easy to see. What Makes DayVue antireflective film better than competitors? Reduces reflections, filters out sun glare and delivers UV protection so that you can read the screen easily in indirect sunlight. Adhesive screen protector adheres to the screen with a low-tack rubber - cannot leave adhesive residues when removed. It will not build in peel strength over time.